Today, like most, we though would wind up to be a stellar day on the Caney. Seeing as it was our first time down for a float on the Caney our hopes were high. I had spoken with Bill Hall about fishig the Caney for the past two weeks and listened to his story of success. 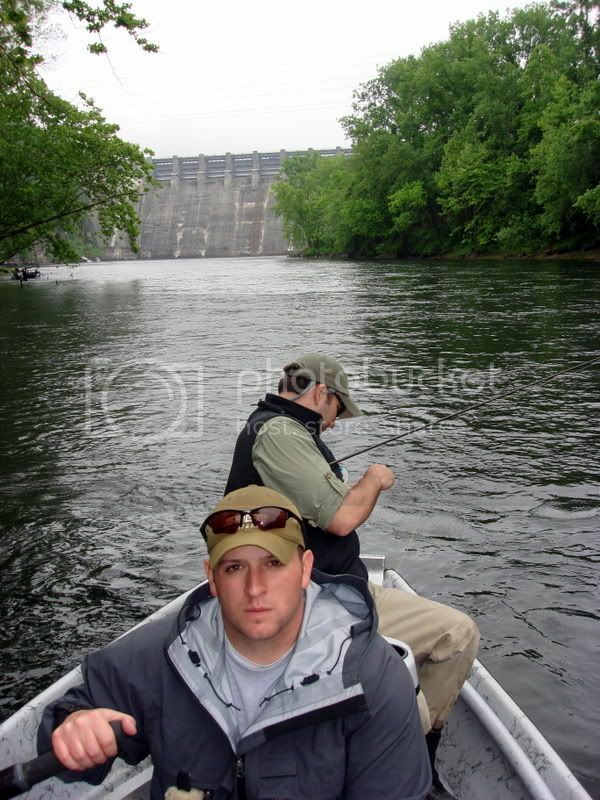 Bill accompanied by my father had went to the Caney two weeks prior and absolutely killed them! So after I gained a little insight from those two I figured we would have an excellent day. They started generating at 9am and were pushing one generator till around 6pm. I’ve been told in the past that fishing during the genereation could be awesome. However something that I later learned was to fish this river on the fall. When they turn the generator off and the water starts to subside. So keep that in mind! Here’s a picture of the dam, I forgot to get it until we had already started our float. The river is absolutely chalked full of fish, at least from the dam to Happy Hollow, which is the float we took. It takes about 6.5 hours to float during the generation with stopping along the way. If you wanted to take a straight float through it could easily be done in about 5 hours. Launching a boat is pretty easy and the take out isn’t far away..There are also a few local shuttles, literally a minute away from the dam. This river would also easily accomodate smaller john boats with small outboard motors and would generally keep you in some really great spots on that river. We saw two or three john boats all day and I believe we were the only ones in a drift boat all day. 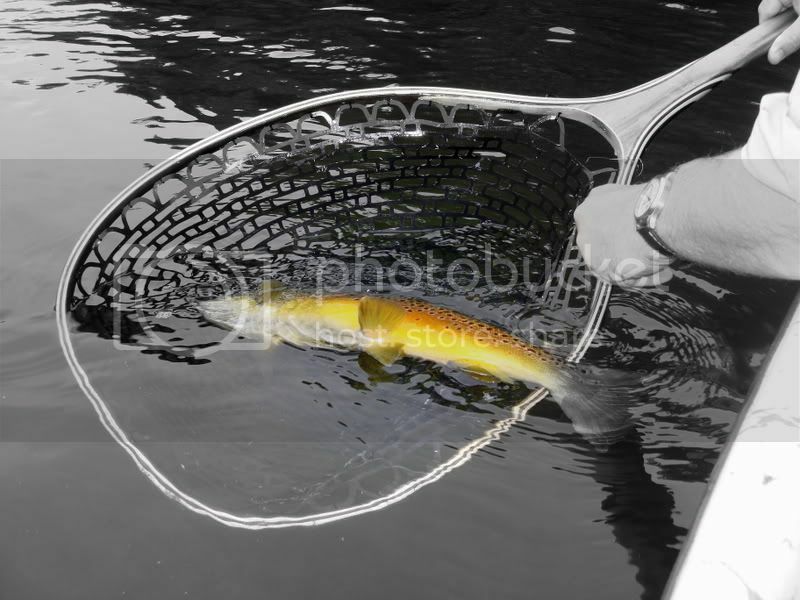 We started out fishing midges dropped deep below an indicator which managed fish sporradically all day. It wasn’t fantastic fishing. We kept watching fish all day and after looking at all of the nice grass beds we decided it would be stupid to keep fishing that way…..Streamer time! 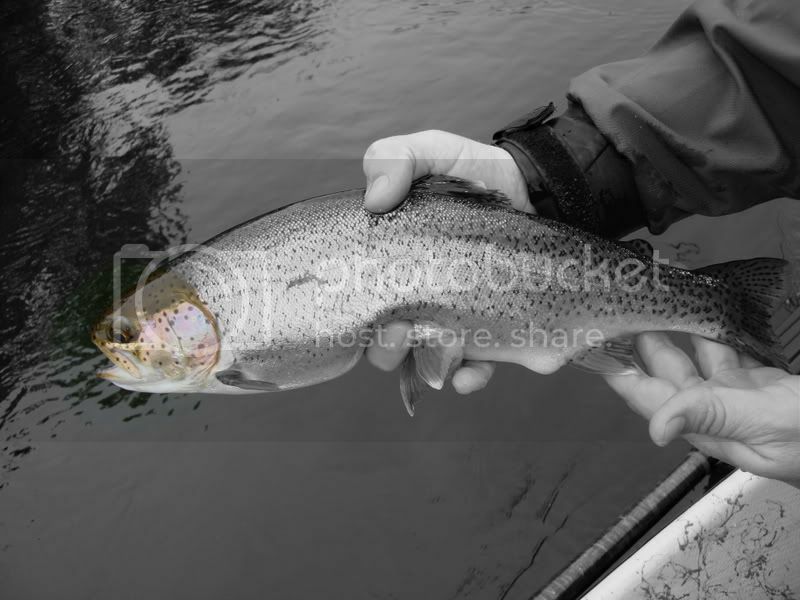 Here’s a shot of a FAT bow caught on a Steven “Bubba” Dark pattern. This fish took Doug into his backing three times. Made for a good morning! Put smiles on all of our faces. Playing with Picasa (A photo uploader from Google.com). It made for a cool picture. Doug made the switch first thwoing on a nice baitfish pattern. Instantly started getting chases. Fish ranging from 10″ to 24″ giving chase to Doug’s fly. After that it became apparent that’s what Kris would have to throw. 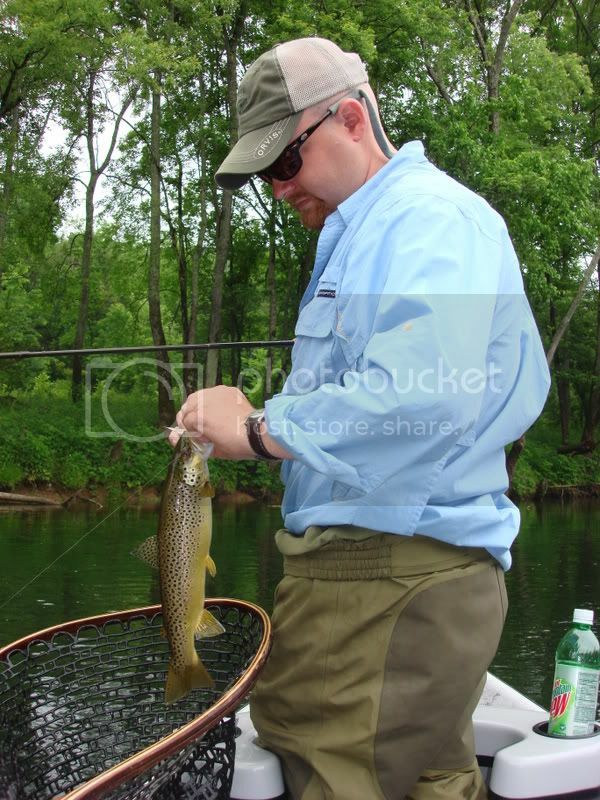 After thouroughly searching the boat for the same streamer pattern, or even something close, we wound up short. This would prove to make an example of being unprepared. Win some lose some! We came close on a pattern Doug had in his bugger barn but it wouldn’t seem to hold a candle to the fly that Doug had been casting. Yet another lesson we would learn at the end of the day was, take seven weight rods in stead of chucking streamins on five weights all day! Once we managed the half way point we started to float along side an older gentleman in a john boat. He had just finished motoring up a run and was in the process of hooking and landing a beast. He snatched his boga grips and lifted up the pig. It was a nice fish! He said it was 8lbs, as we glared in amazement! Awesome! Either way a short time later this nice guy came floatiing by, we think it was his fish. It was a battle trying to net him as he floated by upside down. He showed a little bit of life kicking the net. We finally netted him and tried to revive him. Doug managed to get him moving so let’s hope his nose is upstream and awaiting breeding! I don’t think this guy was 8lbs. though. Anywho, we managed fish the rest of the day at a moderate pace. It seemed as if the half way point was when things started to slow down. But that’s alright with me, I know what that river is capable of, and now we know what we need to do to be capable of landing them. It’s always good to have a day like this. It certainly made us stop and think and the knowledge gained will go miles in helping us out from here. On a last note, when you go fishing make sure your prepared for what the day will throw at you. This was an average fish for the day, while chucking streamers. 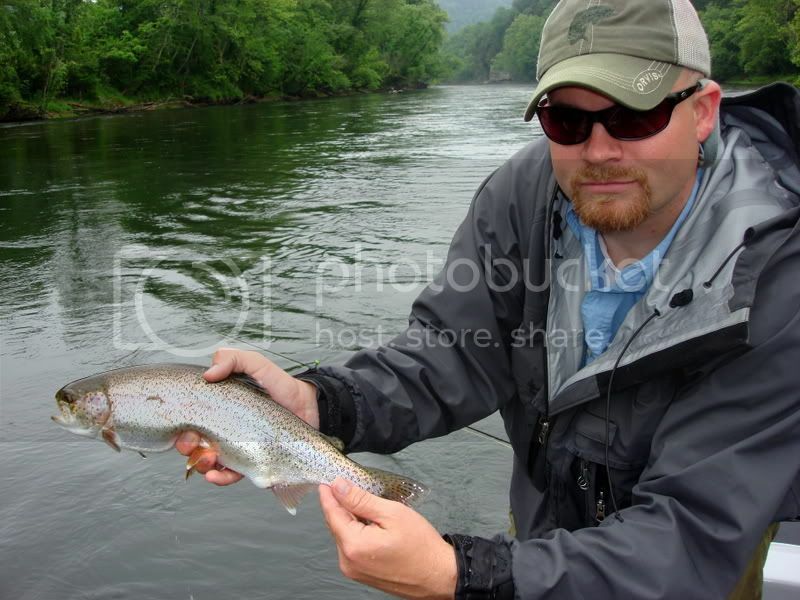 The Caney Fork is an absolutely beautiful river, and I will be back to fish it very soon! It’s only about an hour and forty five minute drive from Knoxville. The only river closer is the Clinch! So keep that in mind. There’s also plenty of wade access throughout the river.